Interfax allows practices to reduce expenses by eliminating the need for a traditional fax line. Users save on the costs associated with printing documents to paper and faxing with a traditional stand-alone paper fax machine, as well as eliminating the cost of fax equipment, maintenance, paper and toner. Since traditional fax lines are not required, Interfax also gives practices the flexibility to have multiple dedicated inbound fax lines to quickly and efficiently distribute faxes to multiple departments. Separate long, inbound faxes can be distributed to multiple providers. various documents to combine in the basket to send at one time. Reduce the time it takes to scan and file paper faxes. Interfax allows users to fax directly into MicroMD EMR so that staff can quickly view and assign a fax to a patient, as well as alert users to fax availability with just a few simple clicks. Providers or staff can securely fax encounter notes and procedure and referral orders directly from MicroMD EMR to referring facilities and providers. 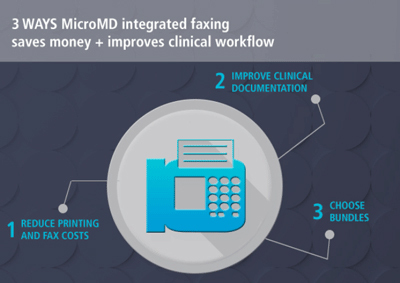 Inbound faxes flow directly into a secure MicroMD EMR inbox and users have the flexibility to establish a specific fax line for patient records to segregate important confidential patient faxes from other business-related faxes, all without the added costs of multiple fax lines. Select from inbound-only or outbound-only, or combine the two options for maximum efficiency. Monthly charges are determined by the volume of fax pages sent, so you only pay for usage. Interfax is packaged in bundles of 500 pages and you can adjust the number of bundles as volume increases or decreases, or add additional fax lines if desired. Below is a comparison between the services offered by a fax machine, a fax server and the Interfax service.